The teachers are Children First Academy put their heart into their job as much as anyone in the world. And they are putting their heart where it’s needed most. It is reported that 70 percent of the student population is homeless. 100 percent is below the poverty line. A student’s living situation could be in temporary housing like shelters. It could be with family. It could be hotels or automobiles or worse. There are two constants that I see. One is bright eyed healthy children who seek love, affection and support. The other is teachers who provide that! The teachers provide a very firm structure with so much care for their students. They command respect and deserve respect. Also, the students commonly run up to the teachers and hug them. This support is important because in addition to not knowing how much food or sleep the children have had, you don’t know how much love and attention they have received. The stable influence of the teachers day to day is vital. 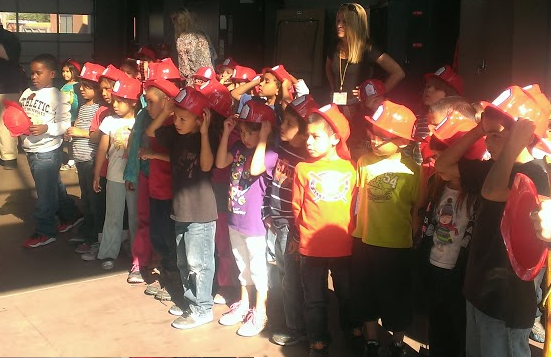 The other day they asked for volunteers to visit the Phoenix Fire Department.